Whether you are going through a breakup, loss of a job, experiencing depressive symptoms, anxiety, or stress at home, you usually turn to those you love and care about to help you through that difficult time. 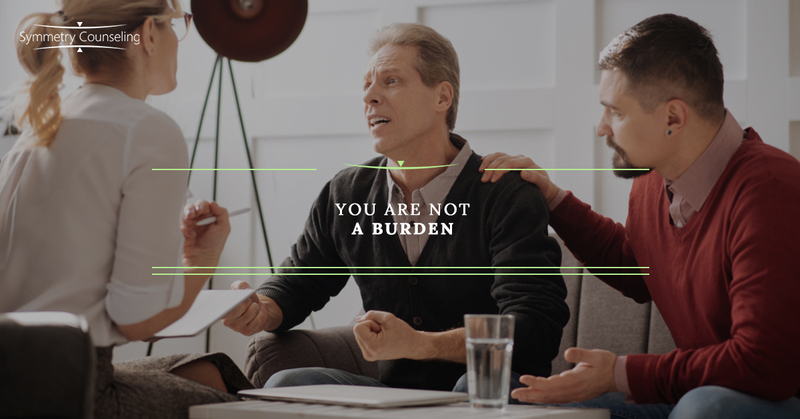 However, if the challenging time seems to be lingering and you are continuously leaning on these people, you may eventually feel like you are a burden to them. You may begin feel that you don’t want to bring anyone down, make their day worse, think they won’t understand, or even be embarrassed and don’t want anyone to know you are struggling. When you begin thinking these thoughts and having these feelings, it is common to begin coping in a maladaptive way. You may begin to close yourself off from them and try to cope with your issues alone in order to minimize feeling like a burden to the closest people in your life. Eventually that armor you built to keep everyone else out doesn’t protect you anymore and you feel isolated and alone in your emotions. When you begin to feel like you have turned away from those who care about you the most, try being open to those who want to help you. It is important to recognize when you start coping alone and challenge yourself to accept love and support from others. Below is a little insight into why it is vital to identify your support system and be open to their support. If the people you reach out to really care about you, they will stick with you. If they turn away during a difficult time, then those people were not an enrichment to your life in the first place. During these difficult times, surround yourself with people who are going to lift you up and listen to you when you need them the most. No matter what your story is or what it looks like, it means something to someone. Find these people and keep them close to you. If you feel you don’t have those people to go to, therapy may be a great place for you to feel safe and understood. Don’t be afraid to use your support system, it is what they are there for. When you are experiencing any kind of distress, it is important keep going and continue to talk through it with those who support you. If you continue to keep everything in out of fear of being a burden to everyone, you may not feel any better. Reach out to those who love you and be open to those who reach out to help you. Reaching out and accepting help is more difficult than it sounds, but push yourself to do it. Recognize that your feelings are important and you are worth listening to. If you are currently feeling like a burden to your loved ones and would like support, it may be useful to connect with a therapist. Contact Symmetry Counseling at 312-578-9990 to set up an appointment with one of our very skilled therapists at one of our two Chicago locations.